I haven't been near as productive as I would like to be this new year but now that ol' man winter is finally getting out of here, spring has sprung and I am feeling a bit more creative. I have forever wanted to paint more hobby like ornaments and I just knew a hunter would have to be added to my collection of santas. 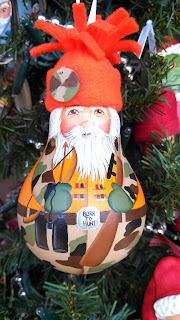 Besides, I don't have many ornaments geared to guys and I am trying to remedy that. This little fellow is what I came up with. He has on a bright orange hat so that he will still safe in the woods. I couldn't bear to add an animal to it as I don't quite like the thought of those precious animals getting killed although sometimes I know it is necessary. Hope you like this santa! Thanks for looking!